Aberdeen bundled Scottish Cup holders Celtic out of the tournament thanks to Darren Mackie's second-half strike. Celtic laid siege to the visitors' goal in the first half but strikers Scott McDonald and Jan Vennegoor of Hesselink wasted good opportunities. And in a rare Aberdeen attack, Mackie slammed in a smart 69th-minute finish. Celtic poured forward in the closing stages but it is the Dons who will now meet First Division Queen of the South in the semi-finals. Aberdeen had been denied by a last-minute goal in the first tie but turned in a stubborn defensive display to make the most of the replay. Celtic started strongly and midfielder Massimo Donati drove over from 30 yards with less than a minute gone. Moments later, Vennegoor of Hesselink headed a Lee Naylor cross over the crossbar from eight yards after good work from Aiden McGeady on the left flank. Celtic remained camped in the Dons half and visiting midfielder Karim Touzani had to react quickly to block Shunsuke Nakamura's drive. Vennegoor of Hesselink then stretched awkwardly to volley Nakamura's perfectly weighted cross over the bar from only six yards out. On the half hour, McDonald found space on the edge of a congested six yard box but his mistimed header from Nakamura's corner flew wide via a deflection. The Dons defence survived another scare when the Australian striker flashed a shot wide from close range after collecting a neat back-heel from Vennegoor of Hesselink. Aberdeen did not threaten until the 41st minute but a lunging interception from Celtic skipper Stephen McManus prevented Barry Nicholson from getting a touch to a dangerous low cross. McManus was then guilty of a slack back-pass but keeper Artur Boruc was quick off his line to save at the feet of Richard Foster. Celtic did not have it all their own way after the interval as the visitors worked hard to close them down and the game grew increasingly scrappy. The ball fell kindly to McGeady on the edge of the penalty area on 59 minutes but the midfielder skewed his shot wide of the target. 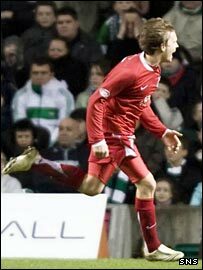 Donati fired another effort over the top before Aberdeen stunned the home crowd by taking the lead. Celtic failed to clear their lines and Lee Miller flicked it on for Mackie to lash a shot beyond Boruc from 10 yards. Nakamura tried his luck with a dipping long-range free-kick but Derek Soutar got down smartly to prevent it creeping in at the base of his post. Soutar had to punch away a Georgios Samaras header and Zander Diamond got a fortunate block on a net-bound nod from Vennegoor of Hesselink. The tall Dutch striker then sent a header narrowly wide and Foster had to clear when Soutar spilled an effort from Samaras. Celtic continued to press forward with Boruc joining in the final attack but the Dons held on for a famous win. Celtic: Boruc, Hinkel, Caldwell (Riordan 84), McManus, Naylor, Nakamura, Scott Brown, Donati, McGeady, McDonald (Samaras 73), Vennegoor of Hesselink. Subs Not Used: Mark Brown, O'Dea, Sno. Aberdeen: Soutar, Maybury, Diamond (Mair 64), Considine, McNamara (Walker 79), Nicholson, Touzani (Aluko 46), Severin, Foster, Miller, Mackie. Subs Not Used: Langfield, Lovell.